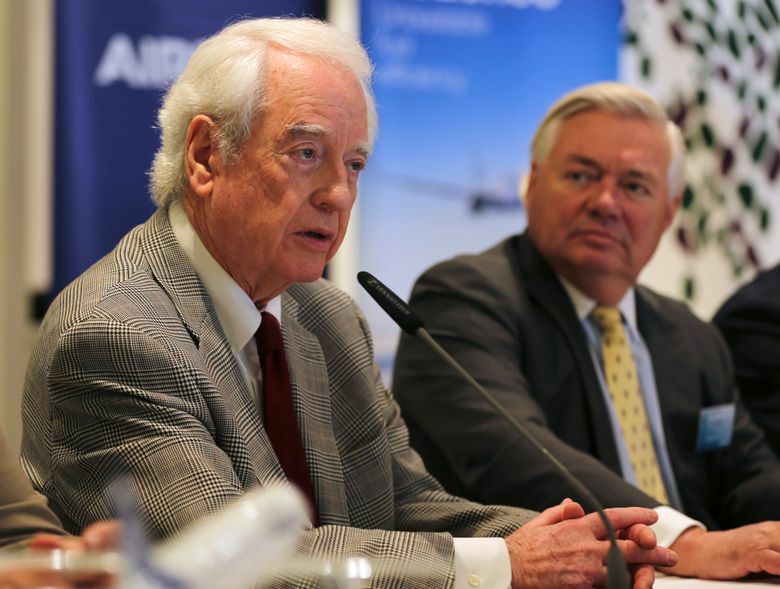 DUBAI, United Arab Emirates — Airbus signed a $49.5 billion deal Wednesday to sell 430 airplanes to the Phoenix-based private-equity firm that owns Frontier Airlines, striking the European aerospace firm’s biggest deal ever at the Dubai Air Show. Meanwhile, Boeing reached an agreement with low-cost carrier FlyDubai to sell 225 Boeing 737 MAX aircraft — a mix of commitments and purchase rights valued at $27 billion. The biennial air show closes Thursday. Buyers, particularly big ones, get large discounts from the list prices cited by Boeing and Airbus. Based on industry data gathered by airline consulting firm Avitas, the estimated actual price for the Airbus pact is $21.6 billion, while Boeing’s deal with Frontier owner Indigo Partners is worth about $12 billion, depending on the final mix of 737 models. The surprise announcement came after Airbus on Sunday suffered the embarrassment of believing it had struck a major deal with the state-owned carrier Emirates to sell its A380 double-decker jumbo jet, only to see Boeing sit on the podium with the airline and sign a $15.1 billion deal for 40 787s instead. 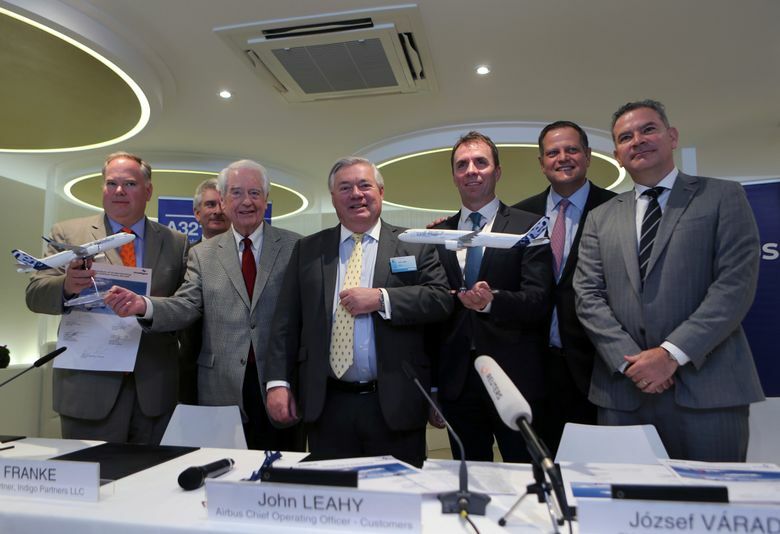 “Just to clarify: This is not an A380 press conference,” joked John Leahy, Airbus’ sales chief, at the start of the announcement. Airbus’ previous biggest sale came in August 2015, when it sold 250 A320neos to Indian budget airline IndiGo (unrelated to Indigo Partners), a deal estimated to be worth $26 billion at list prices. Shares in Airbus rose 2.4 percent on the news. Boeing shares climbed 0.4 percent Wednesday. Franke is a pioneer of the cheap-ticket and high-fee airline business that has spread overseas and is growing in the United States. Such carriers offer low base fares but add fees to stow a carry-on bag, get an assigned seat and for other extras. That’s led to soaring customer complaints against Frontier. Shortly after the Indigo announcement, FlyDubai and Boeing announced their $27 billion deal. FlyDubai said the planes would bring the low-cost carrier’s total fleet on order to 320. FlyDubai has begun to code-share flights with Emirates. Both are owned by Dubai’s government. Boeing said 50 of the first 175 airplanes will be 737 MAX 10s, the rest a mix of the smaller MAX 8 and MAX 9. FlyDubai also got purchase rights for an additional 50 737s. The Boeing 737 MAX 10, a twin-engine, single-aisle plane capable of carrying 230 passengers, has a list price of $124.7 million. The purchase will complement FlyDubai’s fleet of Boeing 737s and keep it a Boeing-only shop, something Airbus no doubt had hoped to change. 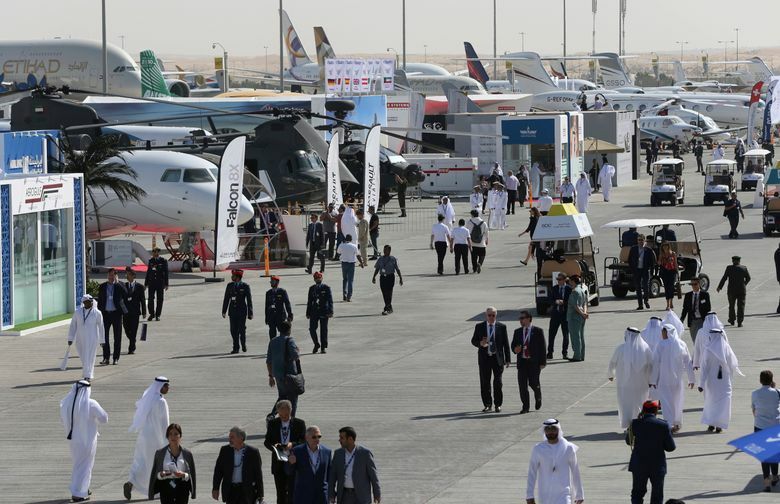 Until Wednesday, the only major deal announced at the Dubai Air Show came Sunday, when long-haul carrier Emirates purchased 40 Boeing 787-10 Dreamliners in a $15.1 billion deal. 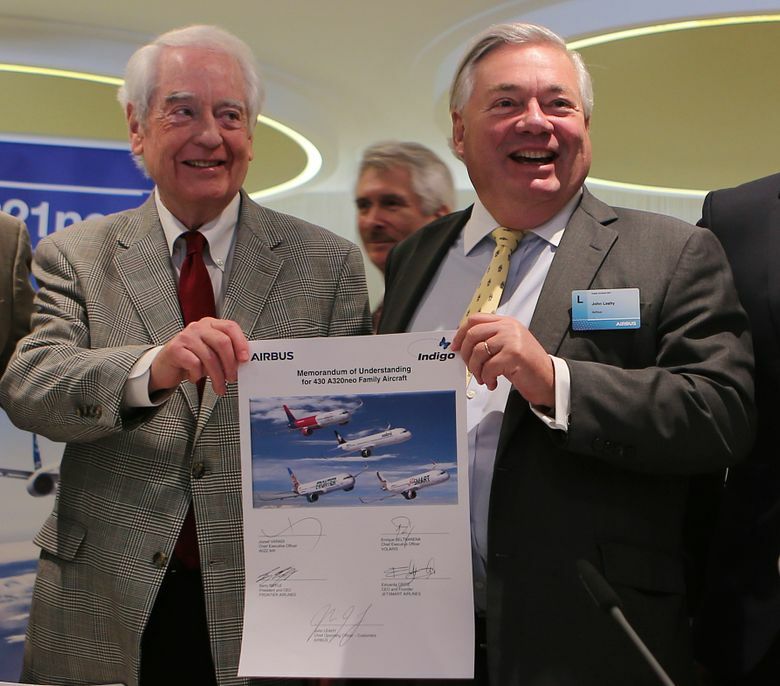 Airbus, based in Toulouse, France, has pinned hopes of continuing production of its A380 double-decker jumbo jet on Emirates, the world’s largest operator of the aircraft. 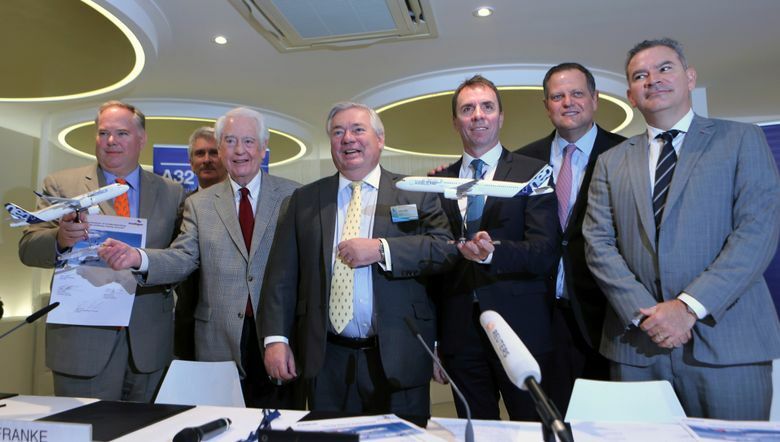 Reports circulated before the air show that a major A380 sale would be coming. 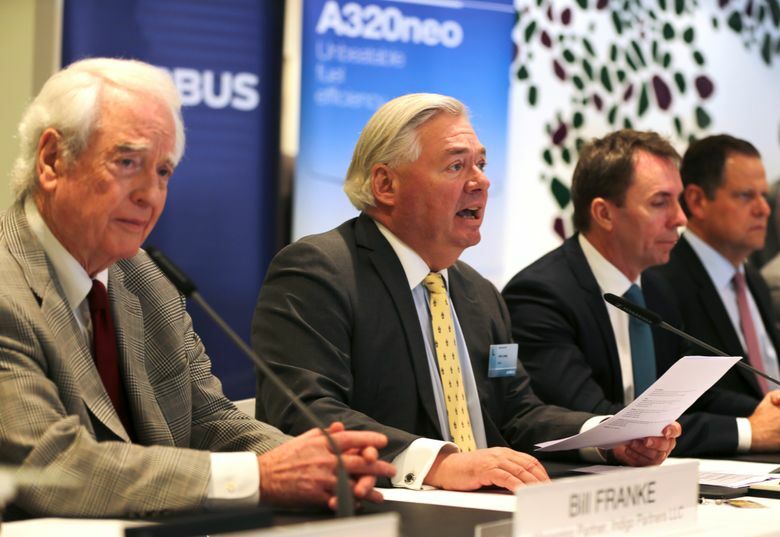 Airbus employees even filled a news conference Sunday, expecting the A380 sale, instead to find state-owned Emirates making the deal with Boeing in front of Dubai’s ruler, Sheikh Mohammed bin Rashid Al Maktoum. Emirates now relies solely on the Airbus 380 and the Boeing 777 for its flights, making it the largest operator of both. It has 165 Boeing 777s in its fleet and took possession of its 100th A380 this month. Seattle Times business staff contributed to this report.